Above & below are Newsletters from Paul Meehan's ministry in Hungary with the Jo Hir (Good News) Hungarian Literature Mission. Please check back soon for updates! On Sunday evening, September 17, a political crisis involving Hungary's prime minister exploded into mass demonstrations on the streets of Budapest. Riots followed, in which protesters vandalized the State television building, burned cars and smashed windows. More than a hundred policemen were injured as well as many demonstrators. The eyes of the world are now upon Hungary as these images have been beamed to 150 countries (click this link to see a news report and pictures from a local newspaper http://tinyurl.com/krm55). (If you have trouble getting this news article, let me know and I will send it to you). In the timing of God, I was on the streets of Budapest with Word of Life Sam Frey, and David Souther of EvanTell, at Blaha Lujza Square, the very place where on the previous night a serious confrontation took place between protesters and police. Far from being threatened or put into danger, I found people more open to the Gospel than perhaps at any time since my ministry in Hungary began. We found many Hungarians to be troubled, angry, confused, concerned, afraid, and looking for answers. What a blessing it was to share the solution in Christ! In all, more than 2000 people received tracts. God also gave us many opportunities to personally share the Gospel, even with some of the protesters. Eighteen people made open decisions to trust Christ. After doing some gospel illusions and asking the people gathered, “Who would like to receive a free tract that can tell you how you can get to heaven”? I was immediately approached by an elderly woman in a wheel chair and her middle age daughter, wanting to know how they could get to heaven. After sharing the gospel, with tears in their eyes, both trusted the Lord Jesus Christ as their Savior. (We were told the woman in the wheel chair did not have long to live). Another particularly moving account involved a middle-aged man at Moszkva Square. He is a stone mason by trade, who moved to Budapest from Transylvania four years ago with his wife and five children. Two years ago he came home from work to find the lifeless body of his 13-year-son lying in his room. He had committed suicide. Overwhelmed with guilt and grief, the man left his wife and family. He sent home his paychecks to provide regularly for them, but he could not bring himself to return home. Instead, he wandered the streets of Budapest after work, tears streaming down his cheeks, mourning his precious son until he fell asleep on the street. He silently sat down next to one of the WOL staff members, who was sharing the Gospel with another man at the time. Noticing his tears, he began to talk to him as well. After a long conversation, the man trusted Christ as his Savior. He smiled for the first time in two years! He also decided to return to his family and tell them the good news of Jesus Christ. “How true it is that the Gospel is "the power of God unto salvation." Please Pray for Hungary during what some have termed Hungary's darkest hour since 1956, and for the thousands of people who heard the Gospel during this week and that these tragic events could be used of God to bring many to Christ if we faithfully proclaim the Good News to them. Pray for a spiritual awakening and a peaceful resolution to the current political crisis. Many people are aware of the recent austerity measures adopted by the Hungarian government. These measures include cuts in various benefits as well as numerous tax increases. The results of these changes are impacting our operating expenses in a significant way. Please keep us in your prayers concerning these things. APPROXIMATELY 125 people,113 of them policemen, were injured, when thousands of people demonstrated on Szabadság tér and in front of Parliament on Monday evening (Sep 18) demanding the resignation of Prime Minister Ferenc Gyurcsány after he admitted lying "morning, evening and night" about the state of the economy in order to win the general election. The protests turned violent when a group broke away from the 2,000 - 3,000 crowd on Szabadság tér and launched an assault on the headquarters of Hungary's national television MTV, setting a part of the building and several cars on fire and engaging in fighting with riot police. According to The Budapest Sun's photographer, Gergely Rónai, the protesters, seemed to be trying to attack policemen only, and were not targeting fire fighters or journalists. An estimated 300 people stormed the MTV building, throwing stones, using metal fencing as improvised battering rams and breaking windows to get in. 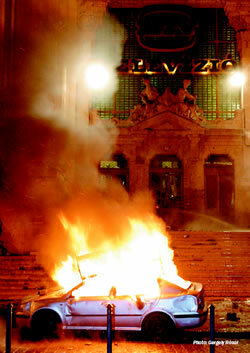 "The police forces were too weak, and the demonstrators soon took command and set around six cars on fire," Rónai said. When the police used tear gas and hoses to disperse the crowd, some protesters sprayed paint on the square's Soviet memorial on the square and pulled it to pieces. A water cannon truck arrived around midnight, but was soon damaged after rioters climbed on top of it. By 1am, several protesters had broken into the building, vandalizing several offices and stealing some equipment. Although the police officers at the site were authorized to use all means required to regain control, they managed only to disperse the crowd at 3:30am. Eight people were arrested, national radio reported. After an emergency meeting of the government's national security council on Tuesday (Sep 19) morning, PM Gyurcsány called the riots "the longest and darkest night in the history of the Republic of Hungary." Political issues cannot be resolved through radical demonstrations, Gyurcsány told state news agency MTI. The Premier, who has said he will not resign, stressed that freedom of expression did not equal a right to violence, and said that "demonstrating in the street is not a solution but a source of conflict and crisis. We have to contain that conflict and prevent crisis," he added. The comments that had sparked the protests were made when Gyurcsány was addressing what he believed was a closed meeting of his Socialist party in Balatonöszôd on May 26. Even so, he was surprisingly candid, and his language colorful. "We have screwed it up. Not just a bit, big time. No country in Europe has ever done anything so impudent as we have done. We have obviously lied over the past one and a half to two years. "It was absolutely clear that what we were saying was not true…. I almost died when I had to pretend for one and a half years as if we were governing. Instead we lied in the morning, we lied in the evening and at night. I am through with this." Parts of the speech were first revealed last Sunday (Sep 17) on Hungarian state radio. Gyurcsány admitted that his party had lied to the public before the elections in April 2006 and that his "boneheaded" government failed to introduce any real policies during its previous four-year term, other than surviving. The PM told commercial television ATV on Sunday evening that he was glad his heated speech had been leaked, as the purpose was to emphasize to his MPs that there were no other viable options but tough reforms. He emphasized that the lies he referred to were characteristic for the entire political elite in the past six to eight years, and stressed that he would like to change the "shameful" domestic political atmosphere. After finishing the first TV interview, on his way to public television MTV, the Prime Minister revealed his speech in full on his internet diary and said in his foreword, "The real question in Hungarian politics is not anymore who lied and when, but who is the one who can put a stop to this. "Who is it that dares to face -honestly, sometimes passionately and with a loose tongue -the lies and half truths of the past 16 years? We did it." Main opposition party Fidesz called on the government to resign at a press conference on Monday (Sep 18) morning, and has since repeated that call. "The government should go; Ferenc Gyurcsány is unwanted in Hungarian politics," Tibor Navracsics, Fidesz's parliamentary group leader told MTI. Gábor Kuncze, leader of the coalition Free Democrat (SzDSz) party told TV2 on Monday that, although he did not agree with the Prime Minister, he thought "it was probably a way to make the ministers understand that reforms are inevitable. "For the past 16 years, politicians have been saying, 'Vote for me and you are going to have a better life,' but finally an argument on this has been initiated which will teach politics and voters that truthfulness needs more support," Kuncze added. President László Sólyom said Gyurcsány had endangered Hungary's democracy and had caused a "moral crisis," according to MTI. Hungary's parliamentary parties were considering a joint declaration on Tuesday, calling on people to express their opinion without resorting to violence, MTI reported. According to the Prime Minister, future demonstrations should not be allowed without a legal permit. I traveled to Slovakia, on Thursday September 21st, where I received my approved visa at the Hungarian embassy. Yea, after much paperwork and aggravation I have a visa! The Lord is so very good! Saturday September 23, 2006 I did some evangelism in the village of Gyömroi this past Saturday. There were about 100 kids and adults. At the end of the program I shared the gospel using the May I Ask You A Question tract. It was great. We gave out about 100 tracts. Gen. 2:21 ¶ And the LORD God caused a deep sleep to fall upon Adam, and he slept: and he took one of his ribs, and closed up the flesh instead thereof; 22 And the rib, which the LORD God had taken from man, made he a woman, and brought her unto the man. 23 And Adam said, This is now bone of my bones, and flesh of my flesh: she shall be called Woman, because she was taken out of Man. 1 Moses 2:21 ¶ Bocsáta tehát az ùr Isten mély álmot az emberre, és ez elaluvék. Akkor kivôn egyet annak oldalbordái közûl, és hússal tölté be annak helyét. 22 És alkotá az ùr Isten azt az oldalbordát, a melyet kivett vala az emberbôl, asszonnyá, és vivé az emberhez. 23 És monda az ember: Ez már csontomból való csont, és testemböl való test: ez asszonyembernek neveztessék, mert emberbôl vétetett. I witnessed a terrible tragedy this weekend when we were coming home from the flea market on Saturday. Two cars ahead of us a mother and daughter were killed when a flat bed 18 wheeler crossed the line and threw the car into a tree. It was the most horrific thing I have ever witnessed and my life will never be the same. So many things run through your head, what if we had left just 2 seconds sooner it could have been us, what if, what if, what if, there are so many what ifs. Nothing changes the fact that it happened it doesn't just go away, as much as I wish it wasn't real, it still happened. I just keep picturing it in my head no matter what I try and do to redirect my attention to something else. I have always had God in my life but I have spoke to the Lord numerous times in the past few days to be sure he knows how thankful and grateful I am for everything he has blessed me with. So to all of my family and friends please keep these families in your prayers as I have kept you in mine. Remember to acknowledge the fact that He has blessed you with the beauty of another day. I love you all and thank you, I am blessed to have you in my life! Please pray as the Lord leads!